This lovely Southern Colonial boasts almost 3, 400 square feet and features a huge, remodeled, eat-in kitchen and a large, family room with vaulted ceiling that will knock your socks off! Gracious formal rooms designed for relaxed living and entertaining, and an Owner's Suite that will blow you away -both with its size and its many amenities, including, but not limited to an en suite glamour bathroom and huge dressing closet! This GEM is loaded with lots of goodies including a brand new refrigerator and disposal; a brand new 50-year Grand Manor Roof; newer HVAC system on 2nd level (installed Nov., 2017); new exhaust fan for 1st level furnace in Jan., 2018; new carpet on entire 2nd floor; newer garage door in 2014; and newer hot water heater! And what a terrific rear yard with play area! Hurry, as this terrific home with 1-YEAR HMS WARRANTY is surrounded by much more expensive properties! 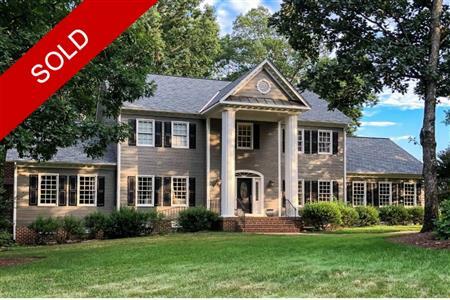 I would like to get more information regarding listing: @ 14501 Sarum Terrace Midlothian, VA 23113.